My parents came to this country seeking freedom. Freedom to choose everything from whom to vote for, to where to live, work, and go to school. A person’s right to freedom was part of everyday conversations and decisions made in my home when I was growing up. It was thread into the stories my grandfather told with me about why he left Cuba, and stories my grandmother told me about why her parents had fled Europe. My parents chose to send me and my sister to a parochial school, a luxury that came with great financial sacrifice. Understanding how precious freedom is, and the need to preserve it, still seeps into everything I do. 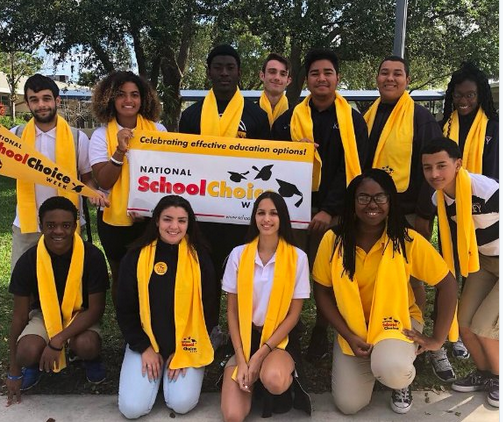 It makes perfect sense that I ended up working with the Florida Charter School Alliance — an organization whose mission is to support education freedom and school choice for all parents. I love the freedom that school choice has allowed my family, friends, neighbors, and every parent in Florida. From Kimberly, a charter mom I’ve become friends with – who painstakingly selected the perfect charter school for her son and daughter, to my friend Yesi who chose a charter school for one child and a district-run program for another. What’s important is that these parents — empowered by educational freedom and Florida’s magnificent School Choice laws – were able to choose schools that best fit their children’s needs and talents. This is exactly what we’re celebrating this week: a parents’ right to choose. From neighborhoods with quality schools to communities where poverty reigns, from the child with exceptionalities to the one seeking an alternative program and a last chance at a high school diploma, this week we celebrate letting education freedom ring and a parent’s right to choose. FCSA Executive Director Lynn Norman-Teck is also a charter school parent of two.